Stunning Sound experience with 40 mm drivers, aptX high fidelity sound. Soundcore by Anker a global leader in technology known for its innovation and intelligent solutions announces the launch of its newest ‘Vortex - Wireless Over-Ear Headphones. Aesthetically designed to provide professionally-tuned audio with aptX high definition sound and monstrous 20+ hour battery life, ‘Vortex’ promises to bring an eternal music experience, making it more gratifying! 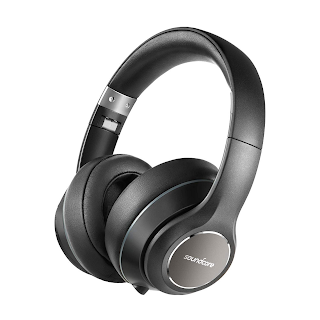 Vortex is Hi-Resolution Audio certified with Crystal-clear highs, powerful-deep bass, and an incredibly detailed midrange Vortex brings the entire music library to life with impressive realism and without distortion. Making every rhythm count, is the audible chamber design which offers the finest listening experience with meaningful noise reduction. The product in shades of black is available with 18 months of warranty in leading retail stores across India.